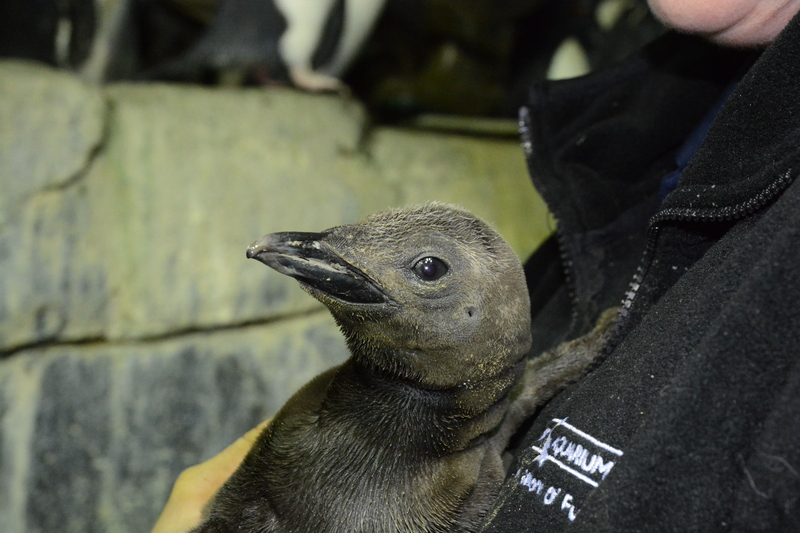 NEWPORT, Ky. — Newport Aquarium announced to a group of schoolchildren Tuesday the addition of a baby king penguin that hatched inside the Kroger Penguin Palooza exhibit. Third-grade students from St. Francis de Sales School in Lebanon, Ohio, went on a field trip to Newport Aquarium and took an “All About Penguins” class ran by the WAVE Foundation’s Manager of Education Programs Dan Dunlap. At the end of the class, Dunlap revealed to the schoolchildren that a king penguin chick hatched on the afternoon of Feb. 7. Senior biologists Dan Clady and Jen Hazeres were stationed inside the cold-penguin exhibit and displayed the chick for the students to see following the announcement. 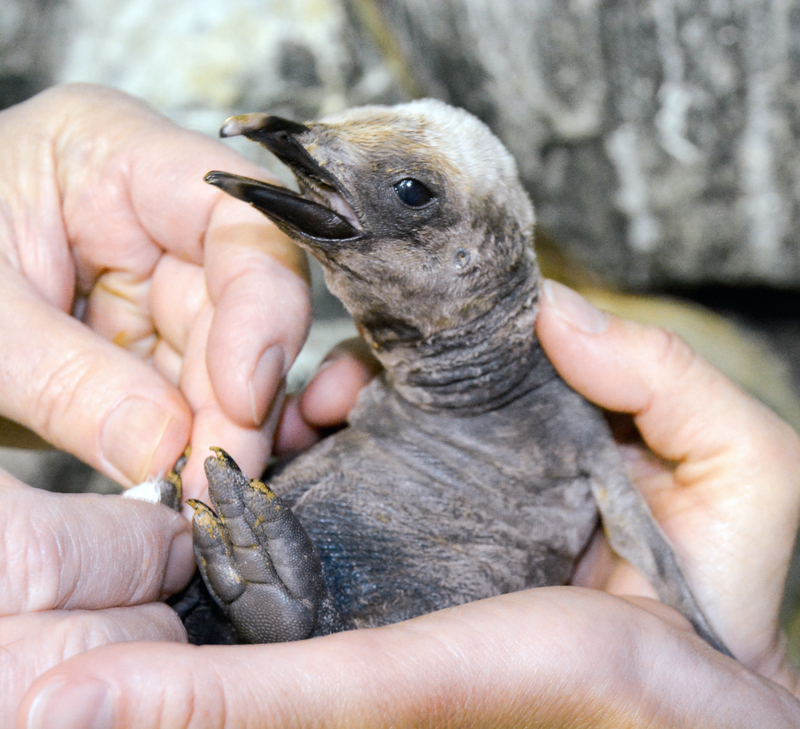 A photo of king penguin chick Kevin Bacon from Feb. 12, five days after it hatched. The king penguin chick has been affectionately named Kevin Bacon in reference to the renowned actor’s 1980 film “Friday the 13th” – the young bird’s due date. Bebe (father) and Wednesday (mother) are the biological parents of Kevin Bacon, the second chick the couple has reproduced in the less than a year after a pair of chicks hatched simultaneously May 24, 2014. Kevin Bacon is the second third-generation king penguin that has hatched at Newport Aquarium. Wednesday was the last king penguin hatched at the aquarium in 2010, before the cold penguin exhibit was renovated and reopened as Kroger Penguin Palooza in March 2011. 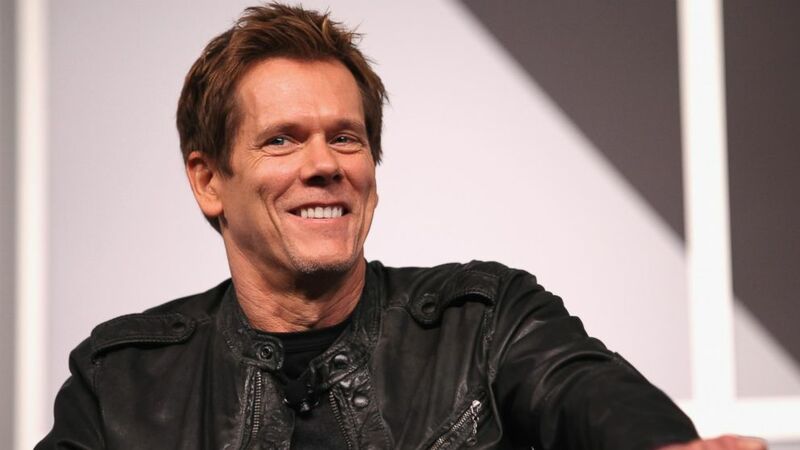 Kevin Bacon initially weighed in at 225 grams and has grown to more than 2.5 pounds (1,188 grams) as of Feb. 24. Guests can catch a glimpse of the chick inside the Kroger Penguin Palooza while the parents share rearing duties. The successful breeding of three king penguins from one institution over a nearly nine-month span is a rarity. There has been an average of only 14 king penguin hatchings annually over the last 10 years at Association of Zoos and Aquariums institutions in the U.S.
King penguin chick Kevin Bacon hatched Feb. 7 and already weight more than 2.5 pounds. Kroger Penguin Palooza features 50 birds that form one of the most diverse collections of penguins in the country. With the addition to Kevin Bacon, there are 13 king penguins in total, as well as chinstrap, gentoo, macaroni and rockhopper penguins. A sixth penguin species, the African penguin, is also on exhibit at Newport Aquarium in The Penguin House. This entry was posted in Penguins and tagged field trip, king penguin, newport aquarium, penguin, penguin chick, school group, third grade by NewportAquarium. Bookmark the permalink.